After years of consulting, teaching, and writing, I remain intrigued by the geographic ignorance I encounter, especially in people who are otherwise educated. This ignorance is often compounded by aggressive cultural bias. I guess she heard the word “Kansas” and thought “small town.” As it happens, the Kansas City Metropolitan Area is among the largest in the Midwest. One of my friends from the Midwest expressed great surprise that I would need a coat in Southern California. Without Midwestern winters, it must always be summer. Every day. My favorite geographic/cultural comment is “I’m bi-coastal.” What does this mean? For some people, the meaning is obvious. I worked with a manager who routinely spent two weeks in New York and two weeks in Los Angeles. Two apartments, two home phones, and all the rest of the confusion. Now that’s bi-coastal! I also know people who were raised on the East Coast and then moved to the West Coast, visiting friends and family back home frequently. Some people seem to use his term used as a synonym for liberal, urban, sophisticated, well educated, and hip. In my opinion, these people are confusing bi-coastal with urban/rural differences. Now my relatives in Arkansas are going to inform me without delay that rural people are often better educated than urban dwellers. They’re right. When visiting relatives in Virginia, I couldn’t find Rhode Island on the map, mistaking Delaware for Rhode Island. Embarrassing!! Of course, I made much of the fact that California has counties larger than Rhode Island. Pretty weak excuse. Perhaps I should quit while I’m ahead. As a writer, I have the choice of setting my novels where I choose. If my choice is a well-known city such as Los Angeles AND I choose to describe the city in a way the public expects, such as dwelling on the beaches or the mean streets, I don’t need to worry that my readers won’t know enough geography to visualize the setting. If, however, I choose to set my story on the Central California Coast, I will run into questions like one from an East Coast colleague who asked if it snowed in that region. I call the Central California Coast, a region several hundred miles long, the least known area of the best known state. I can assume that readers outside California (and some inside!) will not be able to visualize its distance and low population density unless I make it clear. 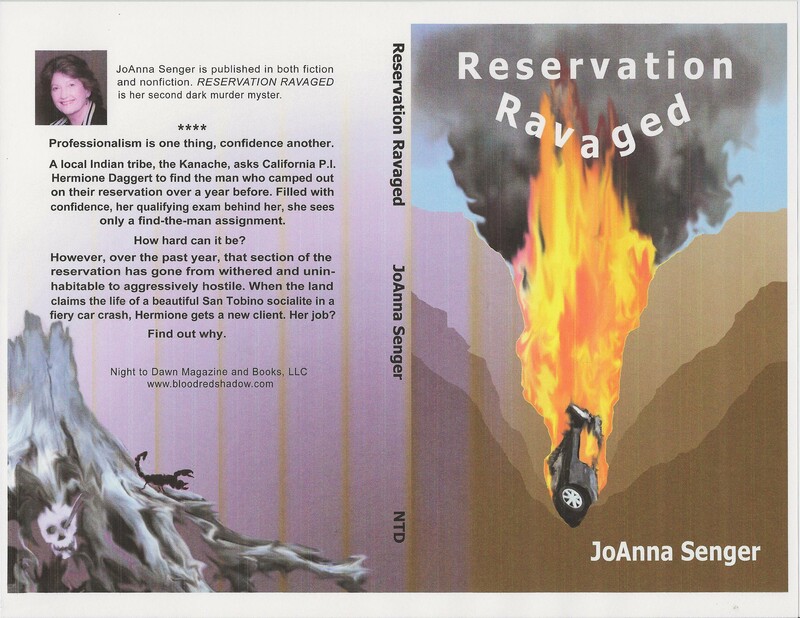 One of my reviewers said that after reading my recent novel Reservation Ravaged, she could have drawn a map. Perhaps our country is so vast that the average reader cannot be expected to have a keen sense of American geography beyond his or her local area and the nation’s largest cities. I’m going to assume that I need to make everything clear…and be willing to upgrade my own knowledge. Now where is that pesky little Rhode Island? If you solve a multiple murder case while you’re still a waitress, people expect miracles from you as a private investigator. At least, for a while. I thought I would like the congratulations and a bit of hometown applause, but thumbs-up signs and “way to go, Hermione” wore on me. I never could think of much to say in response. Fortunately, it wore on the hometown as well. San Tobino is too practical to let local-girl-makes-good last too long. Like an elaborate sand castle on the beach, my local fame yielded to the tide of life in San Tobino: farmer’s market on Thursday, football weekends at the local polytech university and church on Sunday. Even if you don’t participate in any of these local events, your life in San Tobino will be marked by their rhythm. Sometimes I pull my business card out of my purse or pocket, half afraid that my name has washed away like my local fame. But, no. Every time I look, the letters are as crisp as ever. When I got my first job, waitressing at Milady’s Manor, I was thrilled. First time on my own, a job at a famous hotel, and I was in love with life. But I never had a business card. Private investigation is about people: finding them, finding things for them, spying on them, and sometimes consoling them. A few years’ experience gave me confidence and I thought I knew human behavior. Then I encountered a man I can only describe as an outlier, an anomaly. His considerable accomplishments drew no applause, his wit no appreciation. Perhaps there are many like him, but I hope not. It’s just too hard to go through life as he did, successful and alone. What are you supposed to do when, no matter your accomplishments, behavior, or communication skills, people just don’t like you? A dark mystery set on the central California Coast. This least known region of the best known state is mile after mile of sparsely populated coastline, all but empty in comparison to the major cities to the north and to the south, drive-through country with maybe a stop for lunch. But look a little closer. People live here in small cities with lots of miles in between, middle class people, educators, native peoples, travelers, and now and then, somebody you wouldn’t want living next to you. Hermione Daggert, a newly certified California Private Investigator, accepts an easy assignment and then struggles to keep her balance when the very ground shifts under her feet. Available on Amazon.com, B&N, and at http://www.bloodredshadow.com.